One Russian Muslim leader has been shot dead and another wounded, in separate attacks in the Russian republic of Tatarstan, officials say. The Mufti of Tatarstan, Ildus Fayzov, was injured when his car was blown up as he left a radio station in the city of Kazan. A former deputy mufti, Valiulla Yakupov, was shot dead near his home at about the same time. There have been a number of deadly attacks on Russian Muslim clerics. Tatarstan, in central Russia, has a large Muslim population. Mr Yakupov is reported to have been shot as he left his home but managed to reach his car before he died. 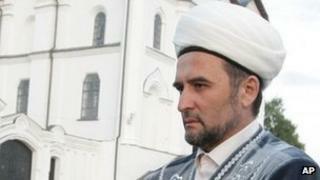 He was the head of education at the Spiritual Board of Muslims of Tatarstan. Interfax news agency reported that he founded Russia's first Islamic literary publishing house and was known as a fierce opponent of Islamic radicalism. Mr Fayzov, too, was known for his criticism of radical Islamist groups, Russian reports said. Islamists have carried out a violent campaign against Russian authorities, declaring their intention to establish an Islamic caliphate. Tatarstan has been much more peaceful and is often held up as an example of religious tolerance in Russia. Security around religious leaders and sites in Tatarstan has been tightened following the attacks, according to the Interfax news agency.